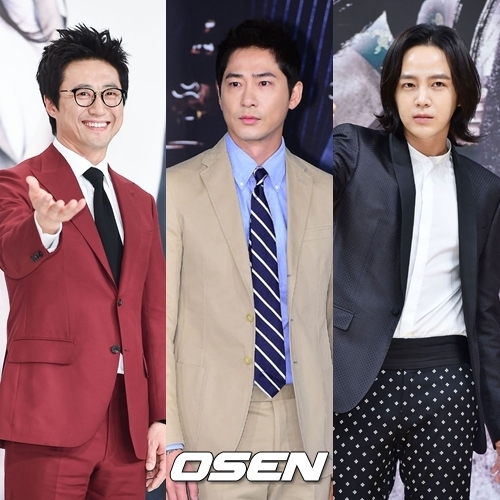 [OSEN=Kim Bo Ra] Would it be Park Shin-yang, Kang Ji-hwan or Jang Keun Suk? Three male actors with different attractiveness came out as leaders of Mon-Tue drama for each of three terrestrial broadcast stations. The war of Mon-Tue drama for famous actors of numerous works attract attention. Three popular men in these days. Before Mon-Tue dramas starring each three men to be aired, the attention towards viewers’ rating competition raised high. Since all three actors are recognized as skillful actors, it derives curiosity about who is going to be the winner. Park Shin-yang’s KBS2 ‘Neighborhood Lawyer Jo Deul-Ho’ (script written by Lee Hyang-hee and directed by Lee Jeong-seob and Lee Eun-jin) is a comic drama about a prosecutor who became lawyer since he kicked out of Public Prosecutors’ Office as he accused corruption about prosecutors and starting second part of his life. Park Shin-yang appears as a righteous lawyer who has both comic personality and intelligent appearance at the same time. It is expected for him to show passion while do not spare himself and express one’s emotion. MBC ‘Monster’ (script written by Jang Young-cheol and Jeong Gyeong-soon, directed by Joo Seong-woo) starring Kang Ji-hwan as a main character Kang Ki-tan is about a lonely revenge towards huge power. He becomes a heir after losing his parents when he was young, but he puts on the danger of losing life after he lost all his money to uncle. He reveals the true horrible faces of privileged class to survive and adds romance arouse in the difficult situation. People pay attention towards how Kang Ji-hwan will represent Ki-tan’s inner loneliness. Both Park Shin-yang and Kang Ji-hwan are the actors famous for passion about the acting while do not spare themselves and have excellent expression skills of characters’ emotion. It is expected to enjoy watching two actors’ detailed acting skills. Jang Keun Suk is in charge of a role who fight his brother to win a love and a country, Baek Dae-gil at drama ‘Jackpot’. Dae-gil is a ‘Perfect Man in Joseon’ who has an intelligent brain, skillful hand and persistence perfectly. Jang Keun Suk who is tall and gentle way of speaking and has favorable appearance will draw triangular romance with Lim Ji-yeon playing a role for Dam-seo and Yeo Jin-goo playing a role for Young-jo. Whether he can express inner pain wandering for a woman realistically or not attacts attention.